In the earlier days, one used to take a loan only for large assets such as House. These days thanks to easy finance one is attracted to go into debt for even smaller assets such as Mobile Phones. Why buy an entry level smart phone when you can get easy finance that can make that expensive smart phone seem much more affordable? The government does the same. It spends money on capital assets that are productive and worthwhile taking debt on, while also spending humongous money for spending on what are basically trinkets. In our earlier post, we looked at where and how the government earned its Rupee. In this post, we shall focus on attention on the spending. While government expects to earn 19.77 Lakh Crore from Tax and Non Tax Revenues and another 1.02 Lakh Crore from Disinvestment and Recovery of Loans and Advances, it shall spend 27.84 Lakh Crores in the financial year 2019 – 2020. In other words, to make ends meet, the government will need to borrow the difference of 7.05 Lakh Crore or thereabouts. In simple terms, for every 1 Rupee the government earns, it shall spend One Rupee and Thirty Five Paise. The borrowing is done by issuing government treasury bonds which are purchased primarily by Banks and other Institutions. Some of the savings we place in Banks go towards buying these bonds and hence in a way the government returns some of the money it collects from us as taxes comes back to us as Interest. In a growing economy, the deficit isn’t much of a concern. But bigger the deficit, smaller of the pie that is available to other corporates and individuals to borrow and one which in its own way forces cost of borrowing to rise for everyone. 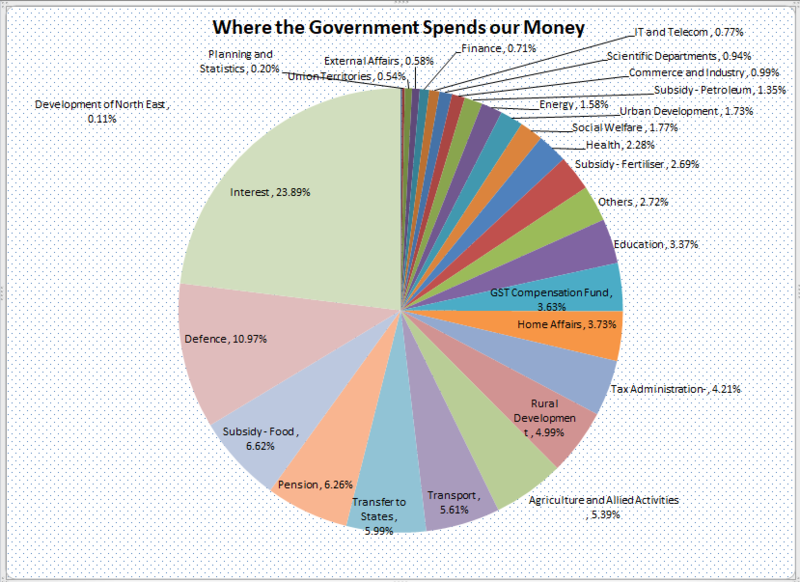 So, where does the government spend all that money and more. Let’s take a look at its major spending items. 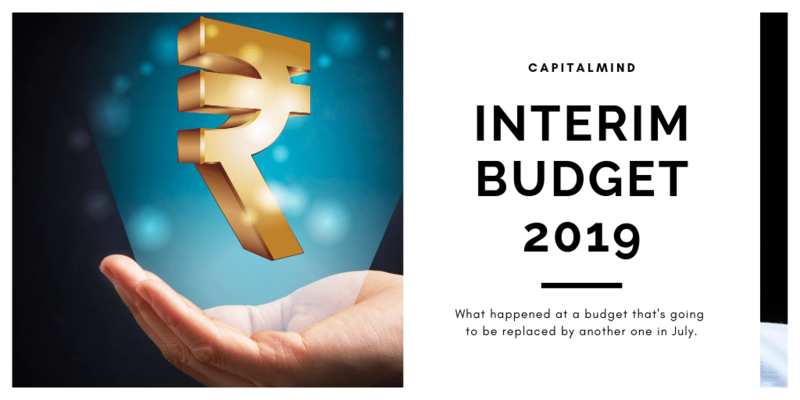 The biggest item on the agenda and one that makes up nearly 24% of its expenditure – Interest it pays on current loans. If you calculate that as percentage of Revenue Receipt, it comes to 32% of its Income. Whoa, you may think, That’s is a bloody big number and it surely is. But as long as the economy grows and revenues keep growing, this is still very much under control. The problem starts when the economy slows and interest payments start to eat up much of the revenue leaving little for investing for the future. Thankfully, we aren’t there, so lets move ahead. Also, if the RBI cuts interest rates it can ease the load for future loans, and ensuring low inflation is one way to nudge the RBI to cut rates. The next biggest expenditure is from Defence (3 lakh crore) which consumes 11% of the total expected expenditure. While this may appear large, for a country of our size and not really friendly neighbours, this as a percentage of the GDP is actually small. The third biggest outlay is for Food Subsidy (1.8 lakh cr) . India provides food subsidy directly and in-directly. The expenditure for such is borne by both the Centre and the States. Food Subsidy is partly targeted at Farmers from whom we buy at higher than market prices (for some Cereals) and partly targeted at Poorer sections of the society by providing it at low cost. In other words, this is Welfare and something that cannot easily decrease. Pension takes up 6.26% of our expenses (more than 1.5 lakh cr) and this is a major number for with growing wages and longer life expectancy, the path forward looks higher. However, this is pensions for government workers, and since 2004 all government workers have moved to the NPS where the return is investment linked, so the impact may reduce after the next three decades. In this budget, Government has announced a pension scheme for unorganised sector where in workers shall get Rs 3,000 after retirement. The details of this scheme which will see implementation by the next government can be a pretty big dent for much of Indian Industry comes under the unorganized sector. Pensions have brought down some of the largest corporates in history, will governments be any better? Well we need to hold our views and see how this gets implemented and the cost of such implementation. Want to read the Budget Documents? Here is where you can get access to all the budget documents.